Enter the ASUS CT-479 CPU Upgrade Kit, an adapter board that will convert specific ASUS Socket-478 motherboards to support Pentium M CPUs. You will remember from our original Pentium M desktop article that the pinout of the Pentium M is different than the Pentium 4, although the two chips are electrically compatible (they use the same FSB). The next problem is that the Pentium M relies on a much lower voltage version of the Pentium 4's FSB, which is also addressed by ASUS' adapter, a problem that we did not think was solvable until now. The CT-479 only works with ASUS motherboards, and only a limited number of them at that. Currently, only the ASUS P4P800-SE and P4P800-VM motherboards are supported, both of which are i865 based motherboards. ASUS is working on support for other boards; the P4C800-E (875P) will be supported soon. For our tests, we used a P4P800-SE; you need a BIOS update, but that's all. 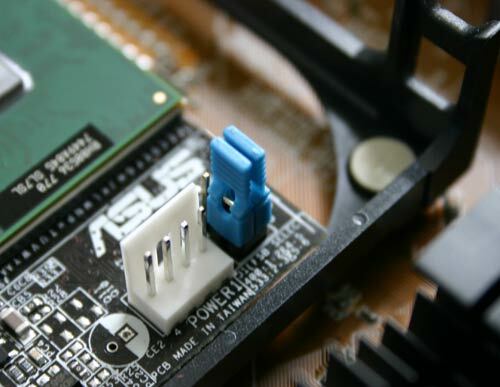 Obviously, non-ASUS motherboards are not supported; however, we're not certain whether or not the adapter can be made to work in other boards. We will be looking into this as time goes on, but we wanted to make sure that we could complete this article first before doing anything that would damage our setup. The CT-479 supports all Pentium M and Celeron M CPUs (Dothan and Banias based) with the exception of the Low Voltage and Ultra Low Voltage versions. The jumpers switch between 400 and 533MHz FSB settings. The power connector powers the adapter. The CT-479 comes with the adapter board, heat sink/fan and power cable. 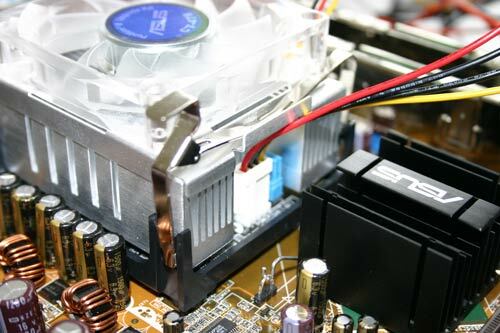 The supplied heat sink is specifically made for the CT-479. Currently, ASUS is listing the CT-479 as a part of a bundle with the P4P800-SE, priced at $130. At that price, the solution is almost half the price of the AOpen/DFI motherboards, and you get all of the benefits of the 865 chipset. The main benefit of the 865 chipset in this case is its dual channel DDR400 memory controller. The 533MHz FSB Pentium Ms are memory bandwidth starved by the 855GME's single channel DDR333 memory controller, so being paired with an 865 gives the CPU more memory bandwidth than it can use. 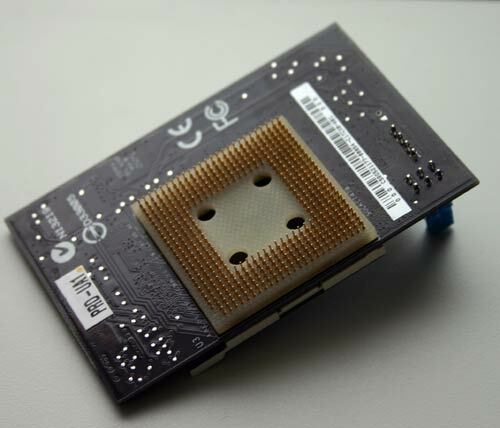 The P4P800-SE that we tested only allowed for 5:4 and 1:1 memory clock speed ratios, meaning that for our 533MHz FSB Pentium M, the maximum stock memory clock was DDR333. But since we're talking about a dual channel memory controller, even at DDR266 speeds, you have enough memory bandwidth for the processor - DDR400 support isn't necessary. The other major benefit of the CT-479 is that you get to use a mature, mass-produced ASUS motherboard instead of a smaller production run, recently released 855GME solution. The benefits were clear in our testing - overclocking the Pentium M was far less of an ordeal on the ASUS solution. 1) System power consumption will be higher on the ASUS solution than on 855GME based systems from AOpen/DFI. The reason being that the CPU will always run at maximum frequency, which is still lower power consumption than any other desktop processor, but it is worth mentioning. 2) You can't adjust the clock multiplier of the Pentium M like you can on the AOpen/DFI offerings. This will hamper the more adventurous overclockers, but it's definitely not a show stopper. You also can't adjust the Pentium M's core voltage when using the CT-479; you're stuck at the default voltage. ASUS' Q-Fan technology (which allows for the automatic reduction of fan speed depending on thermal load) is supported, so you can reduce noise output even if SpeedStep isn't supported. ASUS just announced the CT-479 last week, so there are some details that aren't yet available, such as whether or not the kit will be offered outside of the ASUS motherboard bundle. As soon as we have this information, we'll pass it along, but even if the only way to get it is with an ASUS motherboard, it is still a much better value than a standalone Pentium M motherboard. The question here is how big of an impact does the 865 chipset have on the desktop performance of the Pentium M? To find out, we paired it with the Pentium M 770, Intel's fastest Pentium M running at 2.13GHz. The Pentium M 770 requires a 533MHz FSB, which is supported by the 865 chipset, and thus, is also supported by the CT-479 upgrade kit. Our hardware configurations are similar to what we've used in previous comparisons. Data compression, WinRAR 3.42, KB/s - Irrelevant CPU bench/graph !!! It can be treated as a real life memory subsystem benchmark instead ! Curious how the XPS Gen2 would have faired in this battery of testing... the 915M seems to slightly better exploit the P-M from what I've been seeing, even though the XPS doesn't really focus on things other than gaming. However it would show what a performance focused chipset (and one that is meant to attempt to bring out the most in Dothan) is able to do under these same conditions. Yonah seems to be the magic juice though, but its sad that is really so far away from market. Intel would do well if they could bring Yonah faster to market, even if they had to keep speeds to the 2.2-2.4 range to do it. Quite an interesting article, and one I read carefully on every point. 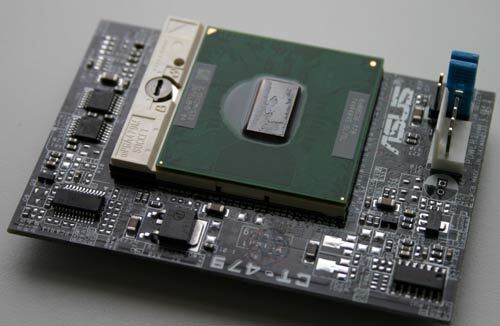 Megahertz for megahertz, and watt for watt, it is easily the best processor on the market. You're comparing that against 3.8Ghz CPU's!! Of course it won't be first place. After all, it's just a 2.13Ghz. It uses 1/4 the power of the highest P4's. Compared against any other processor which comes close to those speed/power specs, it'll wipe the floor with them. If Shuttle made their XPC's with this processor, I'd buy it in a heartbeat.